Shuttle Computer Group, announces its highest-definition digital signage player, the DS81, designed to deliver top-quality advertising, movie trailers, detailed graphics, and the like. Combined with Shuttle’s customization services, the new DS81 offers a wide range of features that can save integrators time and money. A hallmark of Shuttle Computer Group is its ability to offer integrators imaging services and customized BIOS. These services are available to commercial clients considering the DS81. 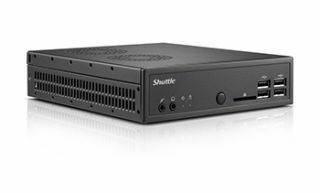 Shuttle assists its customers to define parameters and functions, and automatically uploads specified BIOS in each unit, to make installation and use fast and easy. This imaging offers integrators a way to quicken deployments and reduce costs while maintaining consistency. With a body thickness of only 43 mm, the compact DS81 supports international VESA mount standards and can fit seemlessly in many digital signage venues. The DS81 boasts the Intel Haswell 4th generation chip for lightning fast processing and graphics performance. Shuttle’s DS81 also features an exclusive heat pipe cooling module with a smart fan design which allows for constant air circulation and results in high stability and low noise for long-term operation. In addition to processing eye-popping, rich, detailed 4K multimedia content, the DS81 can also support up to two 1080P displays simultaneously and with built-in USB2.0, USB3.0, RS232 and an additionalRS232/RS422/RS485 port, the DS81 easily connects to a myriad of peripherals for many types of applications. It also has dual gigabit LAN support for network connectivity. A Watchdog Timer provides excellent security protection utility used to maintain normal operation and system stability. The DS81 is currently shipping and is available through authorized Shuttle distributors, dealers, systems integrators and from Shuttle directly. It comes with a three-year limited warranty.